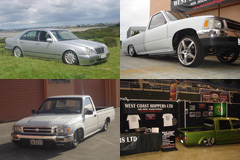 West Coast Hoppers are quickly becoming well known in Auckland for our quality work installing air bag suspension systems for lowered vehicles. We offer full custom air bag suspension sales, design and installation for cars and mini trucks. Our quality products are imported from the USA where the air suspension industry is well established. We have stock available on site or can import a kit especially to meet your requirements. 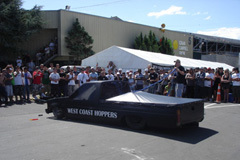 In March 2007 at the V South Island Champs, West Coast Hoppers rolled out our competition air-bagged hopper for a play, wowing the southern crowds with amazing heights as the ‘Navara’ danced about the car park at full noise. If you’d like to witness this truck doing what it does best we will be trying to break our record at the 4 & Rotary Nationals as part of a special feature of the Minitruck Nat's! For a small taste in the meantime, click here to check out the one and only West Coast Hopper. We have just updated the site with more photos of customer rides, events and "The West Coast Hopper". Visit our Gallery and check them out now.